FILE - Afghan men play cricket on a field covered in snow on the outskirts of Kabul, Afghanistan, Dec. 16, 2017. "I love cricket," said Mullah Badruddin, a Taliban commander in Khogyani district of Nangarhar, on the border with Pakistan, where a tournament organized by the militants at the start of last winter drew large crowds. 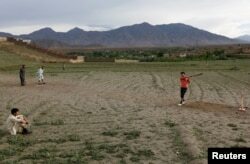 FILE - Afghan men play cricket on outskirt of Kabul, Afghanistan, May 15, 2017. FILE - Taliban walk as they celebrate ceasefire in Ghanikhel district of Nangarhar province, Afghanistan, June 16, 2018.